Fill this white bottle with cold water and watch it transform into a brightly colored hydration helper. When we think fun, we think hydration. That hasn't always been the case, but this bottle changed our minds. Fill it will cold water and watch as the white stainless steel magically transforms to a playful color. (OK, it's science—a temperature-sensitive coating—but it looks like magic.) As you drink up, the color line moves down the bottle. It even comes with a handy carrying strap and removable silicone sleeve, so hands stay comfy even when your H20 is extra icy. Free smiles included with every refill. Designed by Lewis Plowman in the United Kingdom. Made in China. Good news! We heard your feedback, and are pleased to relay that the Color-Changing Water Bottle has since been updated to reduce any metallic after-taste. After graduating from design school in Bournemouth, UK, Lewis Plowman started his product design career by creating giftable goods. When he realized that he wanted to develop more practical items, he drew on what he’d learned about why customers truly appreciate certain products. Now, he works to create things that will be loved by those who admire functional designs. Hand wash only. Wash your bottle with soap and warm water before first use. Click here for full cleaning instructions. Great way to keep track of water intake. Fun for kids. My daughter uses this water bottle during school as well as for her sports and when traveling in a vehicle for trips. I love this bottle! I got the peach one. It's a beautiful color and I love how it changes - so cool! Great for on the go, it's so lightweight you can just throw it in your bag and you don't have to worry about it leaking. The sleeve is handy too and adds another bit of flair & style. LOVE IT! Sadly I can not recommend this water bottle because of the horrible metallic taste. Washing it out will not solve the issue, best to save your money for something else. My daughter is active in life, soccer to volleyball, to hiking and biking. 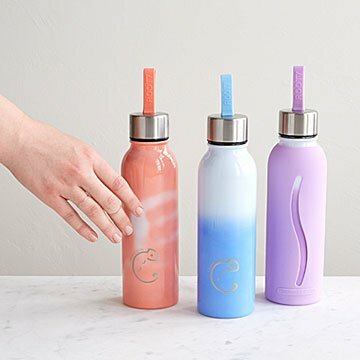 I pre-ordered this cool water bottle but my mistake was that I should have waited to read the reviews about the metallic taste and how no one has figured out how to get it to go away!!! What a waste of money. Bought this for myself because I'm a sucker for fun colors. My only complaints are it does not keep things cold and it has a bad metallic taste that I can't seem to get rid of. This bottle is fun and beautiful and really well made. This makes me so happy, I'd definitely recommend it!!! !